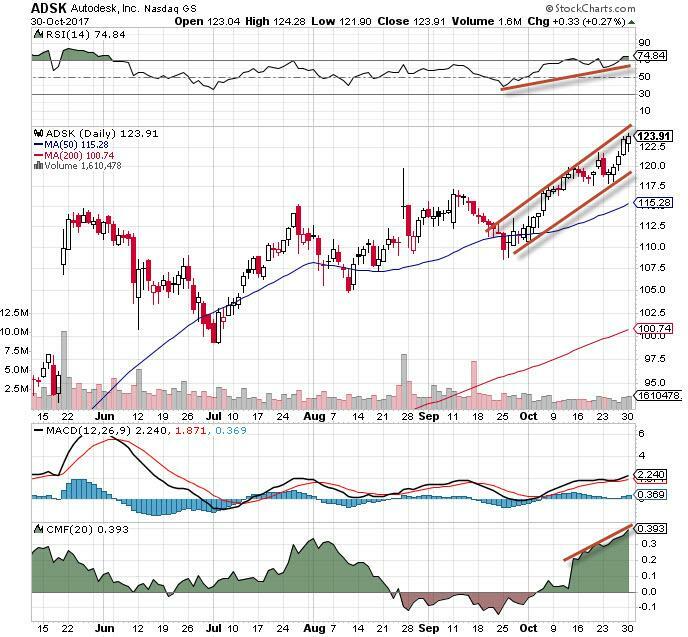 More room to run for software stocks like Adobe from CNBC. Software companies are performing very well this earnings season, but just because there have been some big moves doesn’t mean you’ve lost your chance, Jim Cramer told his Mad Money viewers Tuesday in the show’s “Off the Charts” segment. Cramer spoke with Bob Lang, founder of ExplosiveOptions.net and a contributor to TheStreet.com’s Trifecta Stocks Newsletter. They started by looking at Autodesk (ADSK), the computer-aided design software maker. Autodesk’s move to the cloud and the fact they are selling their software as a service, rather than as a licensing business, has paid off well recently. The stock broke out last Friday on high volume, and Lang says it’s his favorite name in the software group these days. Shares are being helped by strong institutional buying. The Chaikin Money Flow Oscillator, which measures the level of buying and selling pressure in a stock, shows strong money flow into the stock. 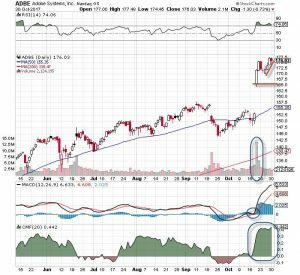 Lang thinks that Autodesk could easily head from $124, where it is right now, up to $140 in the near future. 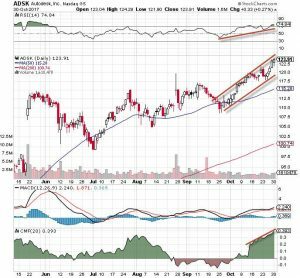 Adobe (ADBE) , a digital media and marketing kingpin, took off a couple of weeks ago after its latest earnings report. For Adobe, the Chaikin Money Flow oscillator has gotten very high, very fast, a sign of healthy demand from institutional buyers. 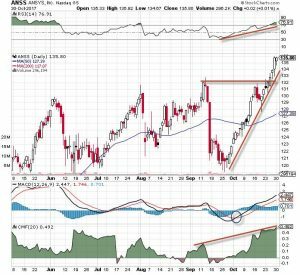 The Moving Average Convergence Divergence line, a momentum indicator that helps technicians spot changes in a stock’s trajectory, recently made a bullish crossover — a strong buy signal. Lang thinks Adobe could be headed from its current $176 level to the high $180s. Two less well-known names are riding the cloud software theme. Ansys (ANSS) sold off in the middle of September, but has rebounded on heavy volume. 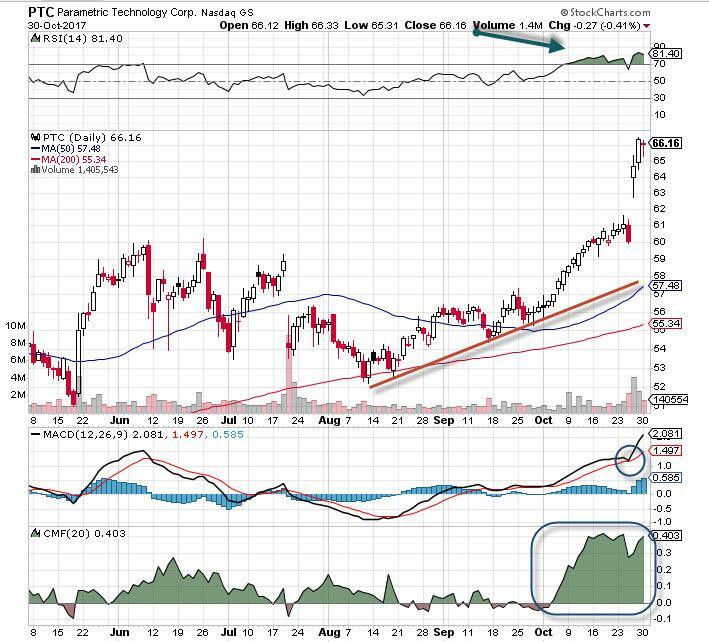 The stock is up more than 10% since the MACD indicator signaled a buy about four weeks ago. Lang expects the stock to pull back to a floor of support at $132, but says that would be a good price to buy in. 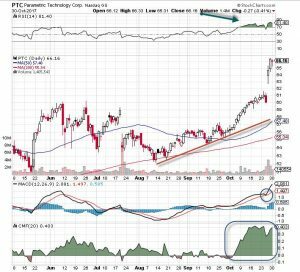 Parametric Technology (PTC) broke higher last week on strong financial results. Lang notes the stock has seen good follow-through since. 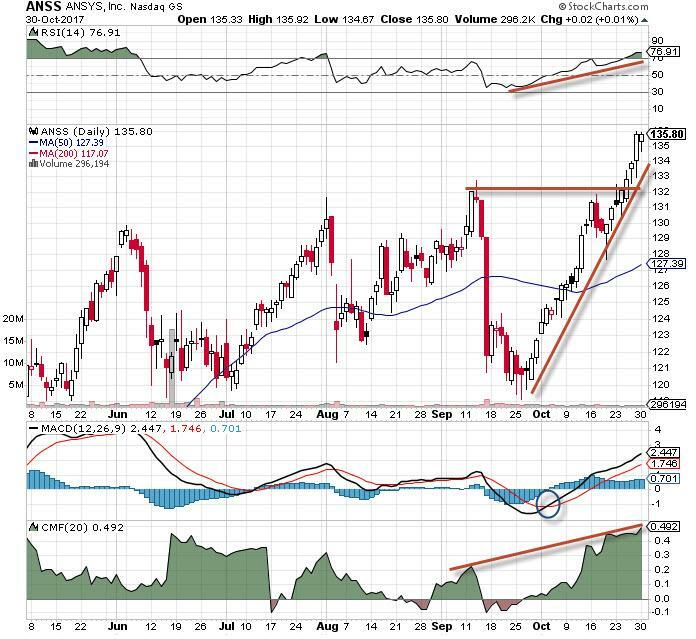 The MACD indicator flashed a strong buy signal last week, and the Chaikin Money Flow oscillator is strongly positive. Lang believes this $66 stock will go to $80 or more in the not-too-distant future, and suggests buying into any pullback.